HARISON B8 is a hot new release stationary recumbent bike with magnetic resistance and a decent flywheel. It is a thick multi-grooved belt driven bike with an electromagnetic control resistance and a decent flywheel of 29 pounds. It comes with a smooth and efficient magnetic resistance of 14 levels for you to work out at different intensities, from simple cardio to increase your heart rate, burn calories and fat, strengthening your leg muscles and intense resistance training. Please note that the regular home bikes often come with only 8 levels of resistance. Harison Recumbent has a real-time digital LCD panel with the regular indicators of distance traveled, time exercised, calories burnt, current speed, rpm (power), odometer, scan and telemetry heart rate through the side arm sensors. You can feel safe and stable on its refined heavy duty stainless steel frame with no shaking or wobbling and that is not easy to break. It is very dense and the surface is oxidation and corrosion resistant, being sprayed with a special baking paint to protect it from rusting. Harison B8 weighs 121.25 pounds and the total user weight capacity is specified as 300 pounds and measures 60.24 x 21.65 x 41.34 inches as assembled. And the LCD display panel is 10.24 x 7.09 x 1.38 inches. 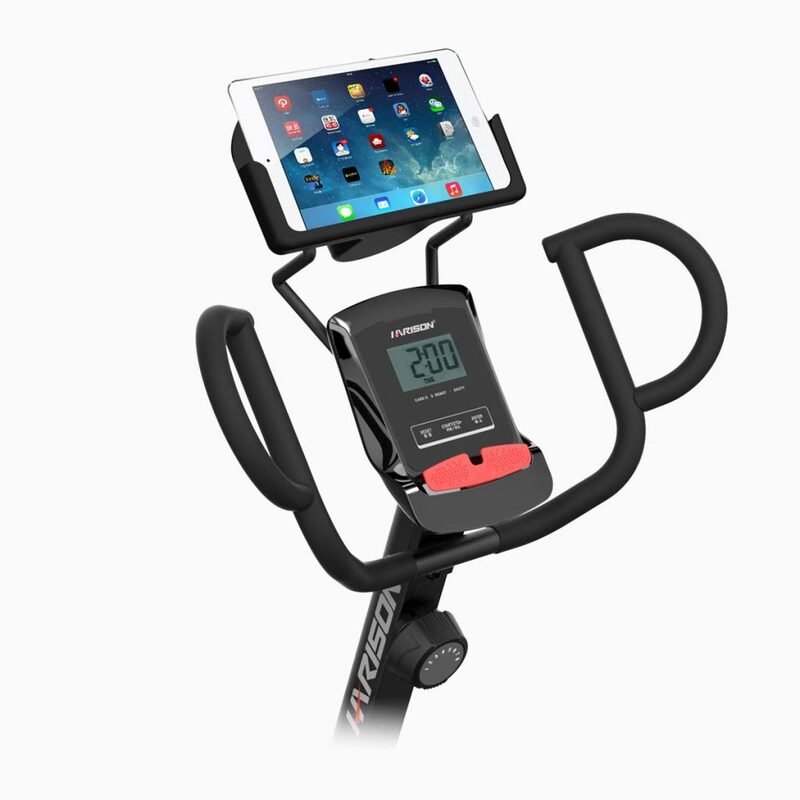 You’ll find a conveniently located two-in-one iPad and tablet holder for your entertainment and distraction during your workout. There is a water bottle holder and you can stay hydrated during your session. The large and comfy seat is properly padded for your comfort during your longer sessions and you can enjoy your ride while burning calories and fat in the comfort of your home. You can adjust the seat for the distance from the panel with the efficient and smooth, corrosion-resistant and durable sliding seat rail system. The seat can be adjusted forward and back on this recumbent bike which also increases and decreases the height slightly. But it can not be adjusted vertically- up and down for height and the comfortable vented mesh backrest with a special design that lets air flow to your back is fixed in its place. Harrison B8 offers plenty of support for your knees and joints, something you’ll benefit from especially if you’re elderly, overweight or chronically inactive. You can enjoy a smooth and stable ride thanks to the Harrison precision balance technology. The pedals give your feet maximum amount of support and are comfortable and safe with a bump anti-slip textured design and adjustable straps. This recumbent bike is not foldable but come with the convenient transport wheels that help the bike to be relocated easily and effortlessly as you simply tilt and roll it out. So you don’t need to do any heavy lifting or cause strain on your muscles. Harrison Fitness has more than two decades of history in the industry with their commercial grade fitness equipment for home gyms. They hold a variety of certifications for healthy and safety and environmentally friendliness and awards like USA Best Buy and Taiwan Excellence. 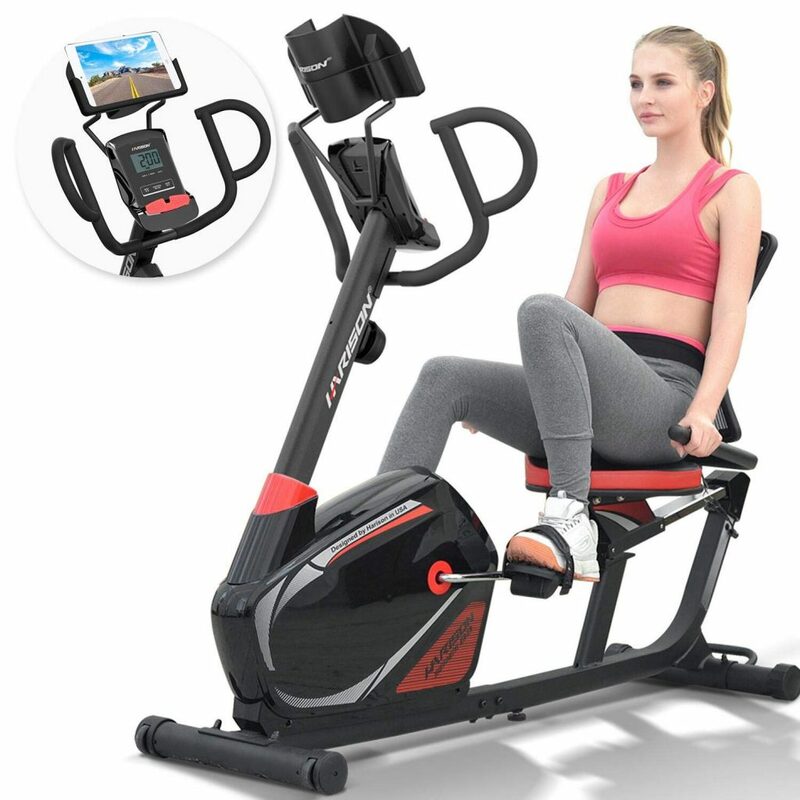 Their products include indoor bikes, elliptical trainers, step machines, incline benches, treadmills, inversion tables and other smart aerobic machines. The Harrison B8 Recumbent Bike is sturdy and durable, functional and versatile, includes a good set of user-friendly features, is easy to assemble, comes with a generous warranty and is sold at a reasonable price. It is offered with a warranty of 12 months for the whole bike, five years for the parts, one year guarantee along with a 30 days of return policy if you’re not satisfied with the product.